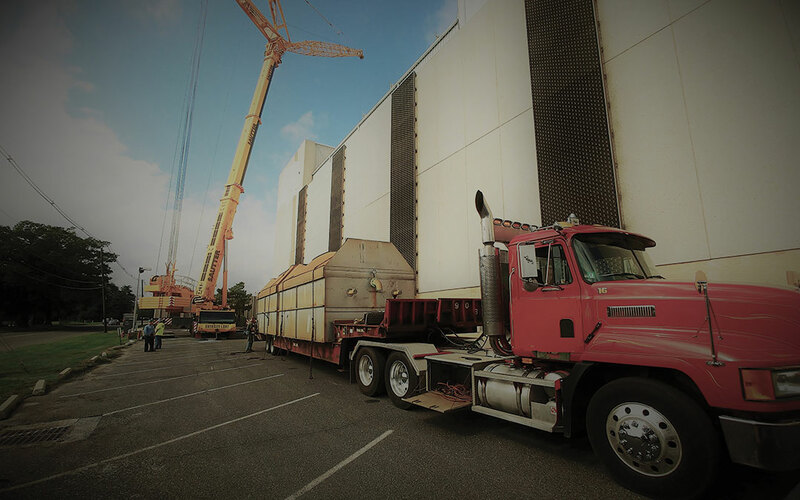 Heritage Industrial Services, Inc. (Heritage) – was contracted to perform the removal and installation of an EC Unit at a manufacturing facility in eastern PA. The project required a tight schedule, due to the fact that there was a plant shutdown required during during the work being performed. The EC Unit was located in very close proximity to energized and operating systems. A detailed (HASP) Health and Safety Plan along with an Engineered Plan was developed prior to commencing the project. The plan involving detailed lift plans, weight calculations, monitoring weather conditions and wind loads, confirming ground stability and a number of other critical factors to guarantee that all lifts were safely performed. Installing the new unit on existing structure. Heritage utilized, a 650-ton hydraulic crane and a 110-ton hydraulic crane in addition to various rigging to perform the dismantlement, removals and installations as described above. Once the pre-existing EC Unit sections were lowered to the ground, they were placed in a lay down area for further dismantling and disposal off site. All debris generated by this dismantling were separated and shipped to the appropriate recycler. The project was performed ahead of schedule which minimized the total shutdown time of the plant and with very minimal impact on production. Heritage takes great pride in completing this complex project on schedule and most importantly incident free.